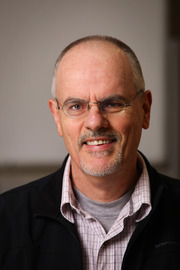 Global Research Publishers is launching Professor Tim Anderson’s timely and important book on Syria. Professor Anderson demonstrates unequivocally through carefully documented research that America’s « Moderate Opposition » are bona fide Al Qaeda affiliated terrorists created and protected by the US and its allies, recruited and trained by Saudi Arabia, Turkey, in liaison with Washington and Brussels. Through careful analysis, professor Anderson reveals the « unspoken truth »: the « war on terrorism » is fake, the United States is a « State sponsor of terrorism » involved in a criminal undertaking. Michel Chossudovsky, Director of the Centre for Research on Globalization, Professor of Economics (Emeritus), University of Ottawa. 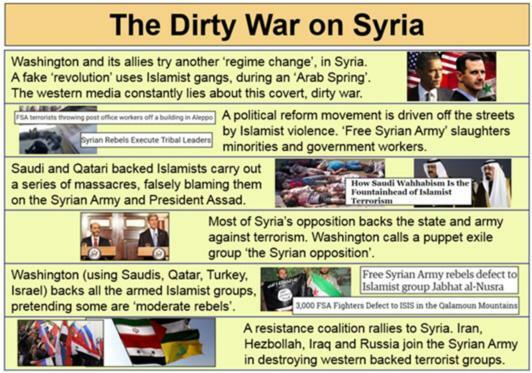 Although every war makes ample use of lies and deception, the dirty war on Syria has relied on a level of mass disinformation not seen in living memory. The British-Australian journalist Philip Knightley pointed out that war propaganda typically involves ‘a depressingly predictable pattern’ of demonising the enemy leader, then demonising the enemy people through atrocity stories, real or imagined (Knightley 2001). Accordingly, a mild-mannered eye doctor called Bashar al Assad became the “new evil” in the world and, according to consistent western media reports, the Syrian Army did nothing but kill civilians for more than four years. To this day, many imagine the Syrian conflict is a ‘civil war’, a ‘popular revolt’ or some sort of internal sectarian conflict. These myths are, in many respects, a substantial achievement for the big powers which have driven a series of ‘regime change’ operations in the Middle East region, all on false pretexts, over the past fifteen years. This book is a careful academic work, but also a strong defence of the right of the Syrian people to determine their own society and political system. That position is consistent with international law and human rights principles, but may irritate western sensibilities, accustomed as we are to an assumed prerogative to intervene. At times I have to be blunt, to cut through the double-speak. In Syria the big powers have sought to hide their hand, using proxy armies while demonising the Syrian Government and Army, accusing them of constant atrocities; then pretending to rescue the Syrian people from their own government. Far fewer western people opposed the war on Syria than opposed the invasion of Iraq, because they were deceived about its true nature. In 2011 I had only a basic understanding of Syria and its history. However, I was deeply suspicious when reading of the violence that erupted in the southern border town of Daraa. I knew that such violence (sniping at police and civilians, the use of semi-automatic weapons) does not spring spontaneously from street demonstrations. And I was deeply suspicious of the big powers. All my life I had been told lies about the pretexts for war. I decided to research the Syrian conflict, reading hundreds of books and articles, watching many videos and speaking to as many Syrians as I could. I wrote dozens of articles and visited Syria twice, during the conflict. This book is a result of that research. I would go so far as to say that, in waging the Dirty War on Syria, western culture in general abandoned its better traditions: of reason, the maintenance of ethical principle and the search for independent evidence at times of conflict; in favour of its worst traditions: the ‘imperial prerogative’ for intervention, backed by deep racial prejudice and poor reflection on the histories of their own cultures. That weakness was reinforced by a ferocious campaign of war propaganda. After the demonisation of Syrian leader Bashar al Assad began, a virtual information blockade was constructed against anything which might undermine the wartime storyline. Very few sensible western perspectives on Syria emerged after 2011, as critical voices were effectively blacklisted. In that context I came to write this book. It is a defence of Syria. 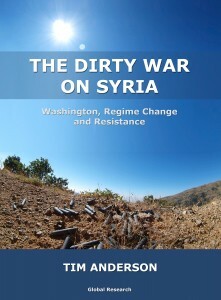 This is a resource book and a contribution to the history of the Syrian conflict. The western stories have become self-indulgent and I believe it is wasteful to indulge them too much. Best, I think, to speak of current events as they are, then address the smokescreens later. I do not ignore the western myths, in fact this book documents many of them. But I lead with the reality of the war. Chapter 1, ‘Syria and Washington’s ‘New Middle East’’ puts Syria in context of the US plans for a ‘New Middle East’, the latest chapter in a longer history of US attempts to dominate the region. Chapter 2, ‘Barrel Bombs, Partisan Sources and War Propaganda’ addresses the problem of reporting and reading the Syrian crisis. Media channels have shown a hyperreliance on partisan sources, committed to the war and denigrating the Syrian Army. This is the key barrier to understanding the controversies around chemical weapons, civilian massacres and the levels of support for or opposition to President Assad. Chapter 3, ‘Daraa 2011: Another Islamist Insurrection’ reconstructs, from a range of sources, the Saudi-backed Islamist insurrection in Daraa in March 2011. Those armed attacks were quite distinct from the political reform rallies, which the Islamists soon drove off the streets. Chapter 4, ‘Bashar al Assad and Political Reform’ explains the political reform movement from the time Bashar assumed the presidency in the year 2000 to the beginning of the crisis in 2011. From this we can see that most opposition groups were committed to reform within a Syrian context, with virtually all opposing attacks on the Syrian state. The chapter then reviews the role of Bashar as a reformer, and the evidence on his popularity. Chapter 5, ‘The Empire’s Jihadis’ looks at the collaboration between Salafist political Islam and the imperial powers in the Middle East. Distinct from the anti-imperial Islamic currents in Iran and south Lebanon, Salafist political Islam has become a sectarian force competing with Arab nationalism across Egypt, Palestine and Syria, and drawing on long standing collaborative relations with the big powers. This history provides important background to the character of Syria’s Islamist ‘revolution’, and its various slogans. Chapter 6, ‘Embedded Media, Embedded Watchdogs’ identifies the propaganda techniques of media channels and the network of ‘human rights’ bodies (Human Rights Watch, Avaaz, etc) which function as megaphones and ‘moderators’ for the Washington agenda. Many have become fierce advocates for ‘humanitarian war’. A number of newer western NGOs (e.g. The Syria Campaign, The White Helmets) have been created by Wall Street agencies specifically for the dirty war on Syria. A number of their fabrications are documented here. Chapter 7, ‘The Houla Massacre Revisited’ considers in detail the evidence from the first major massacre designed (following success of the technique over Libya) to influence UN Security Council consideration of military intervention. While the first UN inquiry group, actually in Syria, found contradictory evidence on this massacre, a second UN group outside Syria and co-chaired by a US diplomat, tried to blame the Syrian Government. Yet more than a dozen witnesses blamed Farouq FSA Islamists, who killed pro-government villagers and took over the area, holding it for some months. Several other ‘false flag’ massacres are noted. Chapter 8, ‘Chemical Fabrications: the East Ghouta Incident’ details the second major ‘false flag’ incident of international significance. This incident in August 2013, which nearly sparked a major escalation involving US missile attacks on Syria, was used to accuse the Syrian Government of killing hundreds of civilians, including children, with chemical weapons. Within a fairly short time multiple sources of independent evidence (including North American evidence) disproved these accusations. 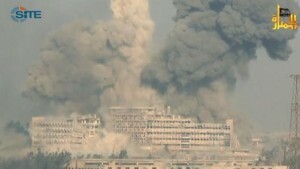 Nevertheless, Syria’s opponents have repeated the false accusations, to this day, as though they were fact. Chapter 9 , ‘A Responsibility to Protect and the Double Game’ addresses a recent political doctrine, a subset of ‘humanitarian intervention’ popularised to add to the imperial toolkit. The application of this doctrine in Libya was disastrous for that little country. Fortunately the attempts to use it in Syria failed. Chapter 10, ‘Health and Sanctions’ documents the NATO-backed Islamist attacks on Syria’s health system, linked to the impact of western economic sanctions. These twin currents have caused great damage to Syrian public health. Such attacks carry no plausible motive of seeking local popular support, so we must interpret them as part of an overall strategy to degrade the Syrian state, rendering it more vulnerable to outside intervention. Chapter 11 ‘Washington, Terrorism and ISIS: the evidence’, documents the links between the big powers and the latest peak terrorist group they claim to be fighting. Only evidence can help develop informed opinion on this contentious matter, but the evidence is overwhelming. There is little ideological difference between the various Salafi-Islamist groups, and Washington and its allies have financed and armed every one of them. Chapter 13 ‘Towards an Independent Middle East’, considers the end-game in the Syrian crisis, and its implications for the Middle East region. At tremendous cost the Syrian Arab Republic, its army and its people, have successfully resisted aggression from a variety of powerful enemies. Syria’s survival is due to its resilience and internal unity, bolstered by support from some strong allies. The introduction of Russian air power in late September 2015 was important. So too were the coordinated ground forces from Iran, Iraq and Lebanon, in support of an independent Syria. When the attacks on Syria abate the Middle East seems set to be transformed, with greater political will and military preparedness on the part of an expanded Axis of Resistance. That will signal the beginning of the end for Washington’s 15 year spree of bloodshed and ‘regime change’ across the entire region.